Jiminy! That Ain’t No Cricket! The top of the growing pile on my desk included paper-clipped information telling all I needed to know about crickets. I reread their description and habits and even had three or four articles about eating them. Apparently it’s not a bad idea. Then, of course, there were the pictures I’d taken. Truth: all that information had been waiting until I could get clear photos — and then a confirmation of what I did have. Dr. William Brown, my very special go-to biology professor on campus, back from a sabbatical last year, surprised me by replying this time from Eskisehir Turkey. (Well, one never knows!) 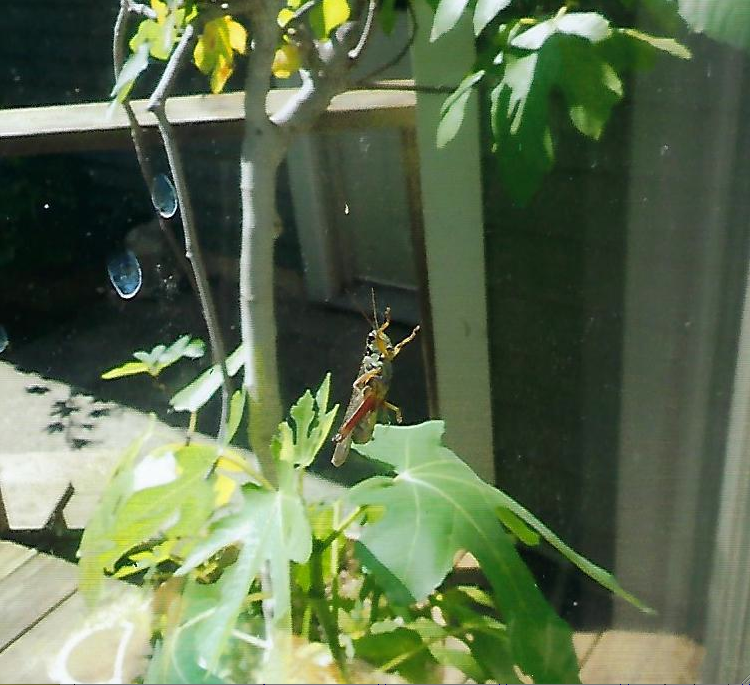 What I had, though, was not a cricket at all but a “short-horned” grasshopper! That certainly sounded unusual enough to make a good column. Wrong again: There are only short- and long-horned grasshoppers and many, many can be found around here. Actually there are more than eleven thousand species of this insect. Not all are around here, thank goodness, but hardly a rarity, is it? Ranging from just 0.2 to 4.3 inches in length, these come in an amazing variety of shapes. Some have wings; others don’t. They can have a long cylindrical body or be short and stout. All have short antennae. Most have a pair of tympunal (hearing) organs at the base of the abdomen. Their hind legs, with greatly enlarged femurs, are adapted for jumping. My next question was to determine the difference between a long- and short-horned grasshopper. The Internet wasn’t exceptionally helpful. The main thing seems to be the long, thin antenna on the long-horned. My research led me astray for suddenly katydids, locusts and, yes, crickets, were all added to the mix. All are in the orthoptera order (Greek: orthos: is “straight”, “pteron “wings”) which number more than 20,000 members throughout the world. Besides the grasshopper, there are 6,400 katydid species, 900 cricket species and 12 locusts species. All have those same long legs and are good jumpers. Wandering even further astray, it turns out all locusts are grasshoppers but not all grasshoppers are locusts. Be glad, for locusts tend to swarm (“density-dependent behavior”). And katydid vs. cricket? Katydids have four segmented feet while crickets have only three. No, really! Main difference seems to be in their sound for it’s claimed the cricket’s is more musical to our ears, pure and low, while “katy” sounds more buzzing, high and not so pure. Dealing only with crickets now, we find that various species are definitely included in people’s diets, even considered a delicacy of high cuisine in certain countries. As a snack consider deep frying the soaked and cleaned insect in oil. Dr. Bob in Men’s Journal says crickets are indeed good for you. While providing less calories than beef or chicken, they may provide as much iron as a steak and almost as much calcium as milk. “Eaten whole. the insects are both sweet and salty, with a nutty taste. Cricket flour has no distinguishable flavor.” Exo, Chapul and others are now selling bars made with cricket flour, a gluten-free powder that’s high in protein and healthy fats. You can also buy Bitty Cookies made with the same ingredients. Hey, let’s give them a try!